(AFP/K. 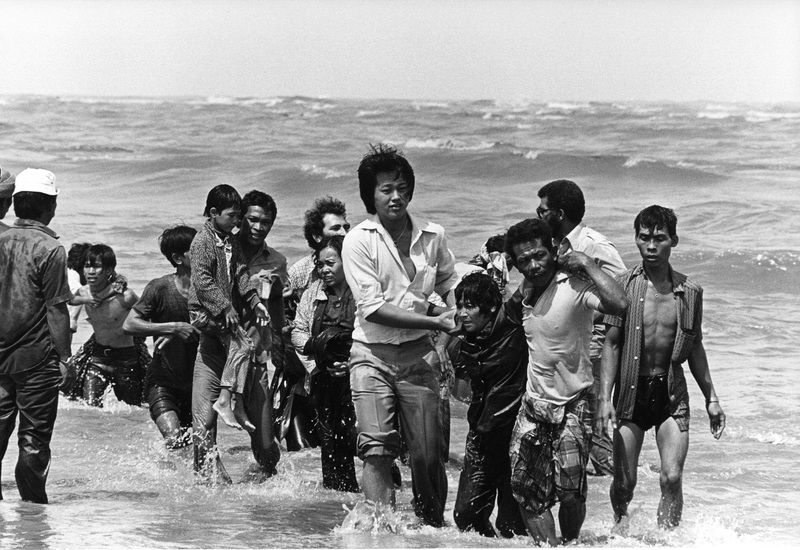 GAUGLER)A picture taken in the late 1970s shows a group refugees (162 persons) arrived on a small boat which sank a few meters from the shore in Malaysia. Mainstream Vietnamese communities began arriving in Canada in the middle 1970s following the end of the Vietnam War. Over one million refugees fled the war-ravaged countries of Vietnam. They were prepared to risk everything. Those who took to the ocean in tiny overcrowded ships were dubbed the “boat people.” The survivors sometimes languished for years in refugee camps. Some were taken in by countries like Canada. Between 1975 and 1976, Canada admitted 5,608 Vietnamese immigrants. 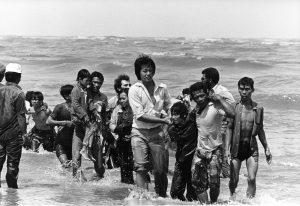 Due to the public outcry, in 1979, Canadian government decided that the number of “Boat People” brought to Canada should be dependent on public support. 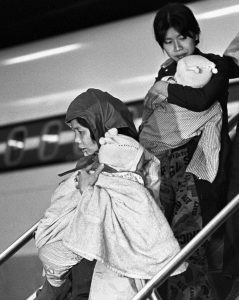 In July 1979, it introduced a matching formula: the government will sponsor one refugee for each one sponsored privately. Churches, corporations or groups of five or more adult Canadian citizens were eligible to sponsor refugees directly. By 1985, 110,000 Vietnamese refugees had settled in Canada. The “Boat People” were internally diverse: they included a variety of social classes and both urban and rural dwellers. The majority did not speak English or French and had no relatives in Canada. They also arrived during a period of economic downturn in Canada. These factors led to a struggle to integrate into Canadian society and to achieve economic independence. They were prepared to risk everything. In the years following the Vietnam War, over one million refugees fled the war-ravaged countries of Vietnam, Cambodia and Laos. Those Vietnamese who took to the ocean in tiny overcrowded ships were dubbed the “boat people.” The survivors sometimes languished for years in refugee camps. The luckier ones were taken in by countries like Canada.